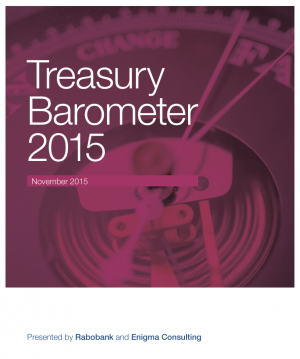 The report, based on the survey held in mid-2015, presents the key results of the second Treasury Barometer. The Treasury Barometer presents the latest trends and developments and provides a unique and representative understanding of the Dutch corporate treasury landscape. Please subscribe and benefit from the latest insights of your treasury colleagues on topics such as bank connectivity, centralisation, Treasury Management Systems, new treasury products, regulations and other treasury topics. After entering your contact details, you can download the full Treasury Barometer report with actual insights and receive invitations for Round Tables around topics on which you would like to discuss with colleagues and thought leaders.